Allows a maximum of 5 symbols, can consist of katakana, hiragana and/or some miscellaneous symbols. Default name is Chris [クリス]. Choice between Male or Female. Affects My Unit’s appearance and determines what class they can be. 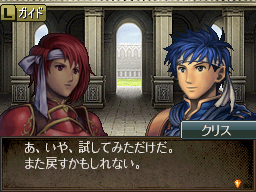 Males can choose to be a Mercenary, Knight, Cavalier, Fighter, Archer or Mage. 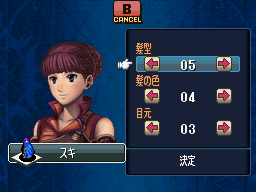 Females can choose to be a Myrmidon, Pegasus Knight, Cavalier, Archer or Mage. From Chapter 1 and onwards, My Unit can be Reclassed like a normal character, so the starting class for male My Units is therefore more important since it decides their Reclass set (at least until you’ve beaten Hard mode or above). The starting class also decides the clothes that My Unit wears. There are 13 hairstyles, 10 hair colours and 10 eye styles to choose from. This is mainly for aesthetic purposes (or amusement), although some characters may refer to My Unit differently depending on certain aspects of their appearance. Decide My Unit’s Past, Present and Future. This affects their starting stats and, more importantly, their growth rates. Note that the Past, Present and Future combination cannot include choices that award the same type of stat/growth bonus (eg. you can’t pick Wise if you have already picked Merchant’s child, since they both award a bonus to Lck and Res). As the game progresses, certain characters will suggest new hairstyles or eye styles to My Unit at the end of a chapter. To try out the new style, choose the option to the left (Yes) and it will kick into effect from the beginning of the next chapter. Upon the next chapter’s end, Marth will ask My Unit if they want to keep the style or not – to remove it, choose the first option (Yes). Otherwise, if the style is kept, it will permanently overwrite My Unit’s previous hair/eye style.